Many of our happiest memories centre on meals with friends and family, and we eat together when we celebrate life's milestones. But in our super-fast modern culture, we have become adept at eating on the go. Is this just damaging to our digestive systems - or to our relationships too? Jesus and His disciples loved to get together to eat, to drink, to enjoy each other's company, and to listen to their Lord. So much so that they were noted for it - and heavily criticized. So why did Jesus do it? It wasn't to annoy the Pharisees - it was because this kind of event mattered. It mattered then and it matters now, and there is much for us to learn from Jesus and His table talk. Pull up a chair and join Jeff this January and February as he eavesdrops of some of Jesus' meals. As we listen, may we know that we're invited to dine with Him today. 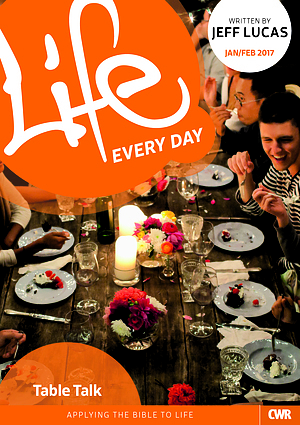 Life Every Day January February 2017 by Jeff Lucas was published by CWR in September 2016 and is our 1424th best seller. The ISBN for Life Every Day January February 2017 is 9781782596011. Be the first to review Life Every Day January February 2017! Got a question? No problem! Just click here to ask us about Life Every Day January February 2017.